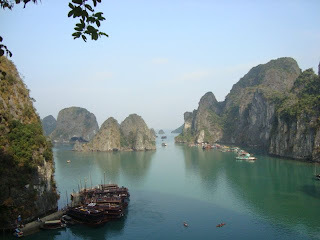 Halong Bay, is the most magical, charming and beautiful place all over Vietnam. The Bay is located in the north of the country, about 300 kilometers from Hanoi, the capital of the country. 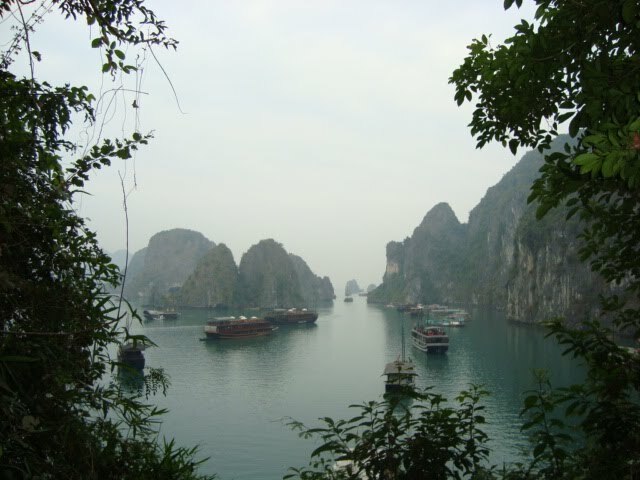 The Vietnamese call this place the Bay of the descendants of the Dragon (Vinh Ha Long). Halong Bay was nominated for the New Seven Wonders of the World, unfortunately Halong Bay couldn't get a place among them. Halong Bay are more than 2000 small islands of karst rock, scattered along 150 miles of coastline, it means more than 15.000 m2 extension, creating an atmosphere and a place of matchless beauty. The bay of the descendants of the dragon (Halong Bay) is known that way for the legend that surrounds this area, or better to say, the origin of this place. Halong Bay Legend says during the time of the Emperor of Vietnam, the Chinese invaders wanted to seized that land of the Vietnamese Empire, the Emperor asked for help to a Dragon family, the dragons threw pearls and jade to sink enemy ships. After the battle, the dragons admire the beauty of the resulting place and the dragons and their descendants decided to stay. A huge place such as Halong Bay demands a cruise to fully enjoy all the beauty and amusements that Halong Bay has to offer. The most convenient option is to book a 2 days / 1 night cruise (around 99$ USD per person). Depending on the tourist operator, transportation from Hanoi may be included in the price. Usually a cruise on Halong Bay includes a full board double cabin, but drinks are not included. During our trip around Halong Bay we will make some stops to visit some of the caves of Halong Bay, formed inside the huge small islands of Halong. 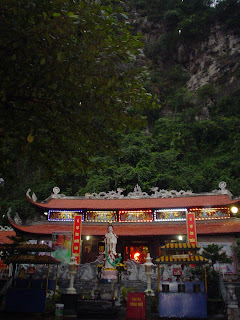 The most famous caves are Hang Sung Sot (cave of Surprises), Hang Dau Go (Wooden stakes cave), Hang Thieng Cung (cave of the Heavenly Palace), Hang Bo Nau (Pelican cave), Dong Tam Cung (cave of the three Palaces) y Hang Trong (Drum cave). 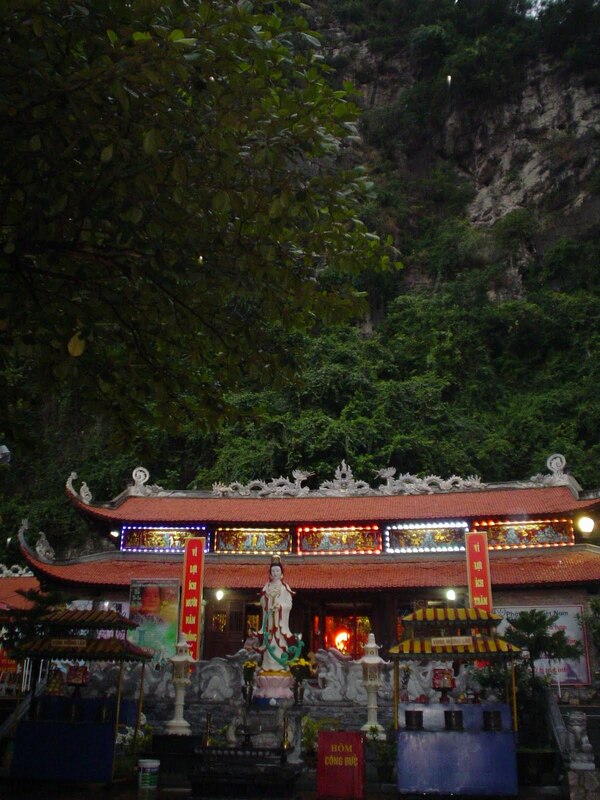 Hang Sung Sot cave is famous for its virile male member shaped rock inside the grotto. French called this place Isle de la Surprise. Compounded of 3 different chambers (the famous rock is located on the first chamber). The main access to the cave is a wooden bridge and 90 steps stairs. 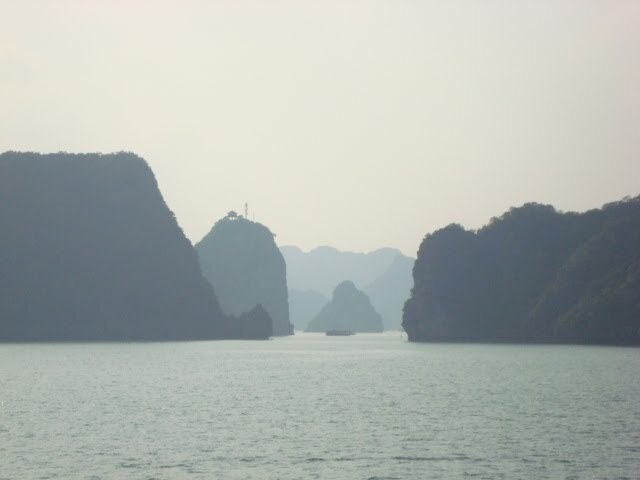 Hard to believe, but around Halong Bay there is almost nothing. A small fishing town, hotels on the sidewalk of the main road, a nice bridge (similar to the ones they have in Lisbon, Portugal) and an outdoor market. The only place around Halong Bay that is worth to pay a visit is Halong Bay Town. To get Halong Bay Town we must cross a wonderful red bridge over the river and next to the sea. Halong Town is just another typical Vietnamese town with colorful narrow houses, a small pagoda and a market (near the harbor). 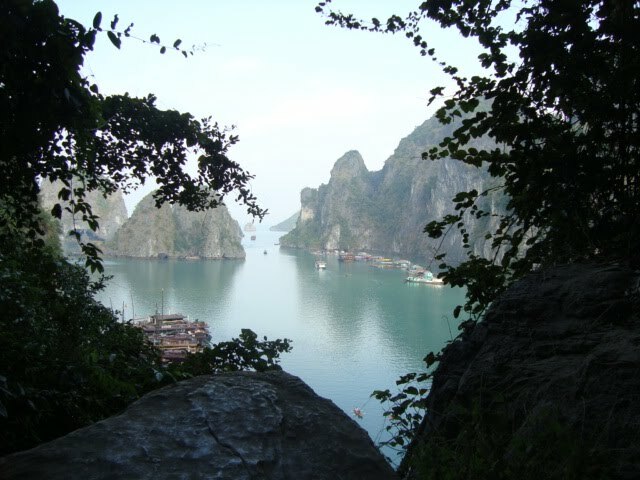 Pictures of Halong Bay, shot from a junk boat and also, from some of the caves of the bay. Video of a cruise in Halong Bay sailing the crystal clear waters of Halong.